The gentle turn from spring to summer beckons us outdoors to welcome in the bright and breezy days of June. Get ideas for an outdoor summer table. Take inspiration from the bounty of a summer garden, and layer the table with flowers. 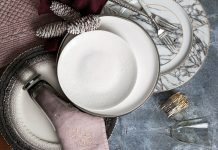 Begin this casually elegant setting with a floral tablecloth, add botanical-print dinnerware, and finish with a flourish—an artistically arranged mix of colorful blooms. 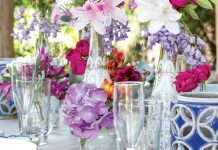 Every element of this open-air-fête is as fresh as a daisy, especially the pretty white cake from a favorite bakery that is dressed up with bunches of those very blooms. Incorporate more of the happy flowers into a centerpiece that spills over with a medley of seasonal beauties—roses, hydrangeas, carnations, and more, plus stems of blackberries and trailing ivy. The perfect beverage for this occasion? Fresh-squeezed lemonade, of course! 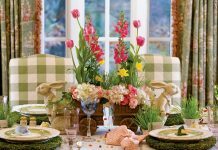 Choose thoughtful accents, like these soft chambray napkins with scalloped trim and lattice-look napkin rings in bright green, to tie it all together and to complement this enchanting summer scene. Don’t miss an issue of our delicious recipes, party ideas for every occasion, and more, plus seasonal themed special issues! 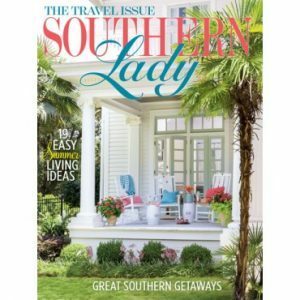 Subscribe to Southern Lady today!